Health care services are always on the lookout for health care appreciation gifts such as custom health care notepads to keep their committed cause highlighted and to boost their brand names. Personalized health care notepads are regular gift choice for health care advertisers all over the world irrespective of their budget sizes and service areas because it offers high value over investment! Undoubtedly, a user will always remain mesmerized with personalized health care notepads and will think highly of a health care service provider whenever they grab a personalized notepad to scribble important piece of information such as keeping track of their treatment schedules and medicines, scribbling down important phone numbers of physicians and community organizations, noting appointments and sharing their health care details with others. 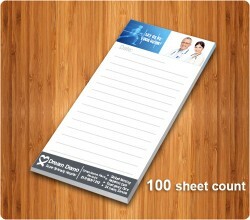 Hospitals, old care homes, pharmaceuticals, holistic health practitioners, alternative medicines, herbalists are some of the health care services who can opt for brand building by employing personalized health care appreciation notepads from our collection.